Martin Bikhit, Kay & Co's managing director, added: "We are delighted to enter into this agreement with Berkshire Hathaway HomeServices. London is a global hub that attracts people from around the world and as specialists in the central London property market we are confident that London will remain a desirable choice for many." Timing for his agency's brand transition is ideal as an influx of corporations to London will likely drive demand for luxury residential real estate, Martin Bikhit said. "We believe there will be a surge of home-buyer interest in areas across central London, driven by the arrival of global tech giants Apple in Battersea Power Station, Twitter in Soho, Instagram and Snap - the parent company of Snapchat - in Fitzrovia and Google and Facebook in King's Cross," he explained. "These companies and others have made informed decisions to establish hubs in London. Their employees will need homes in the months and years ahead, and Berkshire Hathaway HomeServices Kay & Co will be ready to help." With their network membership, Kay & Co gains access to the brand's Global Network Platform, a powerful tool suite driving lead generation, marketing support, social media, video production/distribution and more. The brand also provides global listing syndication, relocation referrals, professional education and the exclusive Luxury Collection marketing program for high-end listings. "Our longstanding clients are going to benefit from this international alliance, which will open up opportunities with fellow Berkshire Hathaway HomeServices franchisees," Martin Bikhit said. "We are joining a network of top U.S. and German estate agencies and as such we're very excited for the future." 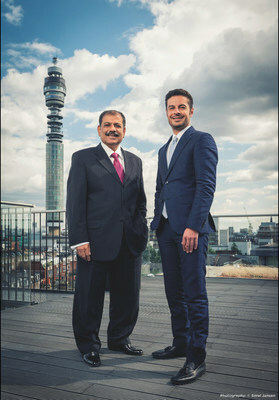 Samuel Bikhit reflected that his family-owned estate agency has matured nicely over the years. "Kay & Co steps forward to a whole new era with a wealth of experience serving the central London market our team dearly loves," he said. "We've seen boom times and we've endured challenging times. The experience has given us a unique insight and understanding of the areas and clients we serve, and that knowledge is hard to beat."